This first major collection of former Los Angeles Times reporter and columnist Ruben Salazar's writings, is a testament to his pioneering role in the Mexican American community, in journalism, and in the evolution of race relations in the U.S. Taken together, the articles serve as a documentary history of the Chicano Movement of the 1960s and of the changing perspective of the nation as a whole. Since his tragic death while covering the massive Chicano antiwar moratorium in Los Angeles on August 29, 1970, Ruben Salazar has become a legend in the Chicano community. As a reporter and later as a columnist for the Los Angeles Times, Salazar was the first journalist of Mexican American background to cross over into the mainstream English-language press. He wrote extensively on the Mexican American community and served as a foreign correspondent in Latin America and Vietnam. This first major collection of Salazar's writing is a testament to his pioneering role in the Mexican American community, in journalism, and in the evolution of race relations in the United States. Taken together, the articles serve as a documentary history of the Chicano Movement of the 1960s and of the changing perspective of the nation as a whole. 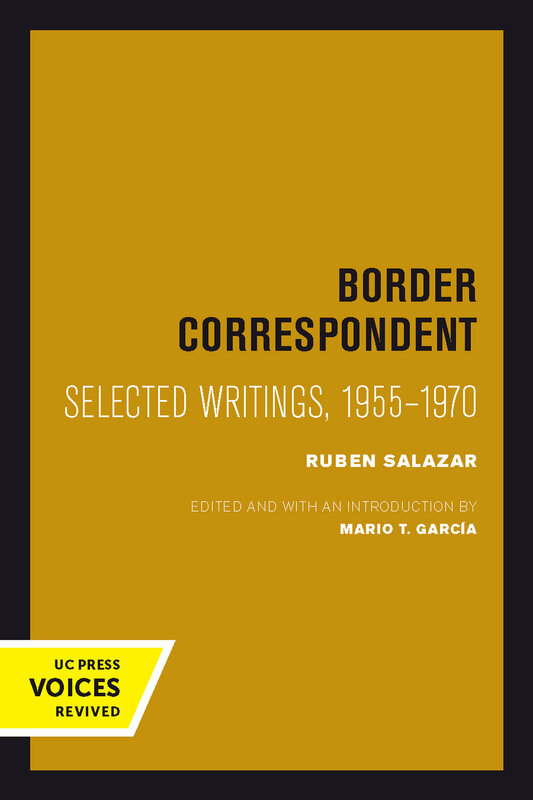 Border Correspondent presents selections from each period of Salazar's career. The stories and columns document a growing frustration with the Kennedy administration, a young César Chávez beginning to organize farm workers, the Vietnam War, and conflict between police and community in East Los Angeles. One of the first to take investigative journalism into the streets and jails, Salazar's first-hand accounts of his experiences with drug users and police, ordinary people and criminals, make compelling reading. Mario García's introduction provides a biographical sketch of Salazar and situates him in the context of American journalism and Chicano history. This title is part of UC Press's Voices Revived program, which commemorates University of California Press’s mission to seek out and cultivate the brightest minds and give them voice, reach, and impact. Drawing on a backlist dating to 1893, Voices Revived makes high-quality, peer-reviewed scholarship accessible once again using print-on-demand technology. This title was originally published in 1996. Ruben Salazar was a reporter and correspondent for the Los Angeles Times from 1959 until his death in 1970. Mario T. García is Professor of History at the University of California at Santa Barbara. His most recent book is Memories of Chicano History: The Life and Narrative of Bert Corona (California, 1994).